2017 Generic Drug Access & Savings in the U.S.
Photo Credit: Source: AAM Member Survey, 2017. Congress, the Trump Administration, and many state governments have been considering a range of policy options to address the costs of prescription drugs. AAM promotes policies to accelerate development of and access to more generics and biosimilars while blocking policies that would result in reduced access. The report documents massive improvements in quality of life and health outcomes for patients, federal and state taxpayers, employers, providers, and others. Monetary savings are a significant part of the story, but access entails a range of other benefits. Generic drugs have saved the U.S. health care system $1.67 trillion in the last decade, generating $253 billion in savings in 2016 alone. Medicare savings amounted to $77 billion ($1,883 per enrollee) and Medicaid savings of $37.9 billion ($512 per enrollee). 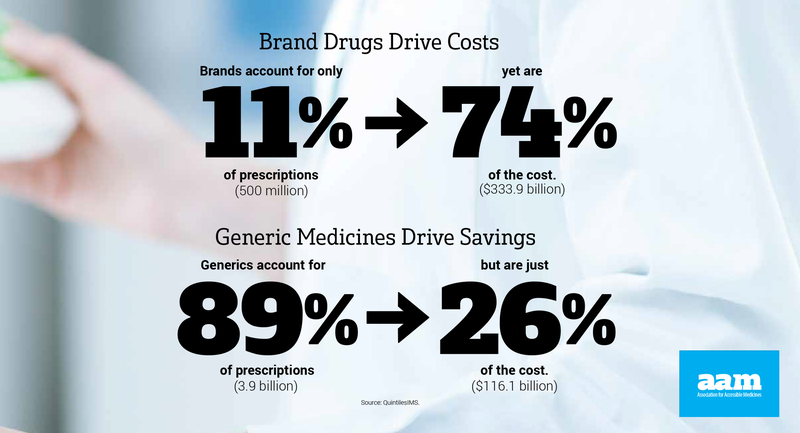 Generics account for 89% of prescriptions dispensed but only 26% of total drug costs in the US. The report also looks at state-by-state savings and generic savings by therapy area. Notably, the most savings from generic drugs were found in mental health ($44 billion), hypertension ($29 billion) and cholesterol ($28 billion) treatments. For the first time, the third-party researchers who conducted the study analyzed the differences between brand and generic “abandonment” behaviors. That is, once patients request a prescription at the pharmacy, do they pick it up, or do they abandon a medication that could improve their lives? The report concludes that new patient abandonment rates for brand-name drugs are 266% higher than for generic drugs. Copays play a significant role in abandonment; 90 percent of generic copays are under $20, compared to 39 percent of branded copays. We encourage you to mention, share and retweet @AccessibleMeds with shareable images and advocate for lower #drugprices. Generic drugs save us all money by keeping prescription costs competitive. Explore the map below to see how much your state saved in 2016.